What do the following poets and writers have in common: Laurie Anderson, Antler, Amiri Baraka, Martha Bergland, Wendell Berry, Kimberly Blaeser, Norbert Blei, William Burroughs, Thomas A. Clark, Wanda Coleman, Cid Corman, Robert Duncan, Susan Firer, Allen Ginsberg, James Hazard, Susan Howe, David Ignatow, Collette Inez, Lisa Jarnot, John Koethe, Ted Kooser, James Liddy, Mary Oliver, Joel Oppenheimer, Jeff Poniewaz, Jerome Rothenberg, Mark Strand, Denise Sweet, Marilyn Taylor, Diane Wakoski, and Derek Walcott? Elementary, my dear reader. They have all made guest appearances at Woodland Pattern Book Center during the past 25 years, along with many hundreds of other poets, musicians, performers and artists who have crossed the threshold at the unpretentious book store on Locust Street. But Woodland Pattern’s casual air of quiet simplicity should not deceive anyone into thinking that it is anything less than a unique book seller which stocks over 27,000 titles published by small and independent presses as well as a distinguished Mecca for poets and other artists. “The reputation of Woodland Pattern is itself national in scope, and I know of no other center — anywhere in the U.S. — that has carried on a more intricate and demanding programming in the literary arts,” said writer Jerome Rothenberg. The Council for Wisconsin Writers agrees about the importance of Woodland Pattern: “[Woodland Pattern is] an energized, intelligent, honest space, both physical and spiritual, in which writers and those who love words (and, on occasion, music) can come together to refresh and sustain each other.” Woodland Pattern will be celebrating its 25th anniversary with a jam-packed, 3-day weekend of special readings, workshops and performances beginning Friday, November 18, through Sunday, November 20. Many local friends of Woodland Pattern will be participating, as well as friends returning from other parts of the country. Everyone is cordially invited to attend these special 25th Anniversary events. Friday night’s events begin at 7 pm and include a screening of a film by Jennifer Montgomery. There will also be readings by writers Lisa Jarnot, Terry Kapsalis and Peggy Hong. On Saturday, November 19, from 10 am — 12 noon, Lisa Jarnot will present a workshop entitled Basic Elements, which will focus on the basic building blocks of poetry. In the afternoon, from 2 — 5 pm, writer Martha Bergland will present a workshop entitled Understanding and Revealing Characters in Fiction. That evening Roberto Harrison, Kiki Anderson and Keith and Rosemarie Waldrop will be reading. Lisa Samuels will introduce the Waldrops. On Sunday afternoon at 2 pm, there will be readings by Wanda Coleman and Martha Bergland. At 7 pm on Sunday, November 20, Hal Rammel, Music Curator, will present a special program. 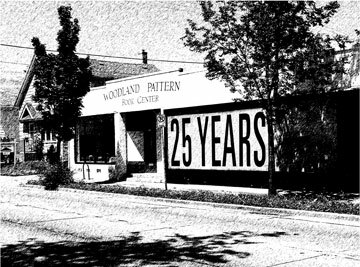 Woodland Pattern has been providing a safe harbor for cutting edge poetry, art and music since 1980. As writer Marjorie Agosin noted in 2000, “I believe you have established at Woodland Pattern a sense of community, both in terms of providing a physical gathering place as well as a sense of extended universal communities where the imagination flows, where there are no barriers in the pursuit of quality works that are so often made invisible.” The 25th Anniversary Celebration is a time to honor Woodland Pattern’s special past and to revel in the beauty and variety in the works of the distinguished writers who will be on hand for the event. Perhaps it is also a time to knock on the wooden door at 720 East Locust Street for the first time, just to see for yourself what all the fuss is all about. For further information, please call Woodland Pattern at 414-263-5001.